We’re excitedly preparing for Open Farm Sunday, our biggest event of the year, and maybe even to date! What is Open Farm Sunday? 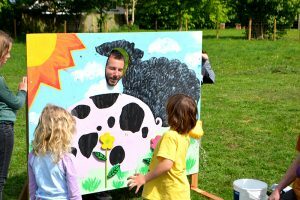 Open Farm Sunday is a national event organised by LEAF, where farmers across Britain are invited to take part and host an event. 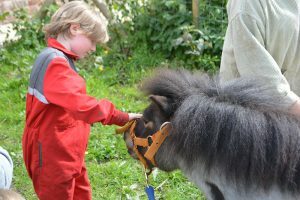 This year, we’re hoping that Humphrey, our Shetland pony, will be ready for his debut pull of the pony trap. Our friends from Burges Salmon are volunteering their time to make sure that the pony trap is painted up and looking fabulous. Our other animals, such as the lambs, and Pippa, the pot-bellied pig, will also be there to meet you. There’ll be plenty of activities to keep the kids entertained; a treasure hunt, face painting, apple bobbing, arts and crafts, and woodwork will all be on offer. The whole family will be entertained with live folk music by local artists, the Stapleton Freemasons will be running the bar, and our tasty barbecue will be even more delicious, as we serve gourmet burgers using grass fed beef reared on the Farm, topped with cheddar and onions. Our sister enterprise, Vassall’s Cafe, will be serving vegetarian chilli and soup. Unique flowers and ornamental plants will be on sale from our plant nursery and our farm shop will be selling our full range of produce, alongside local craft stalls and a Brandon Trust charity shop stall. Our sister enterprises, Fired Up Ceramics and Banwell Pottery, will also be selling unique pottery made by people we support. The day relies entirely on volunteers so we welcome anyone who has time to help out. We’ll provide all our volunteers with food and drink. Please get in touch if you can help out on the day. We’re also planning a separate open day event for Special Educational Needs (SEN) professionals. For more information, please email us. We’re hoping for a really good turn out, so come and join us for great food, good fun, and the joys of farming!